Here we are in the hottest month of the year. The last thing you want to do at home is add more heat with a hot oven. But dining out isn’t cheap and can be a budget killer. How do you make dinner without turning your whole house into an oven? Here are five ideas to feed your appetite yet help keep you cool. 1. Grill:Grilling isn’t just for meats. 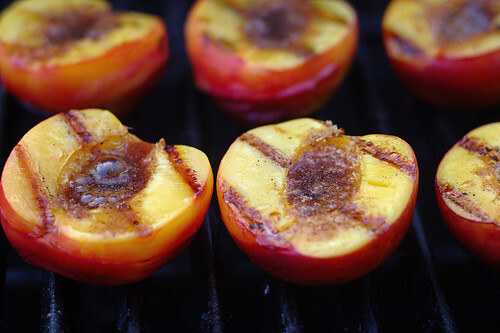 Put your vegetables and (certain) fruits on the grill for delicious flavor and easy cooking. You can even cook pizza! If you don’t have an outdoor grill, that’s okay. We have an electric indoor grill that’s easy to use, clean and doesn’t heat up the kitchen! 2. Stovetop: Cooking on the stove does generate warmth, but not as much as an oven. You might want to choose foods that cook quickly. Fry bacon to make delicious BLT sandwiches for a cool, quick meal. 3. Microwave: Buy foods you can prepare in the microwave. The only heat you’ll experience will be from the food itself. Trader Joe’s is my favorite store to pick up dinners we can just heat and eat. 4. Crockpot: For some reason, I think of my crockpot for making meals in the winter. However, it’s just as useful now and will give you oven results without leaving you sweltering. You can slow cook just about anything. One of my favorite sources of recipes is A Year of Slow Cooking. 6. Take-Out: Picking up a main course is often less expensive than eating at a restaurant. We often pick up a roasted chicken at the big box store ($5) and build a meal around that. I usually prepare two dinners and one lunch from the chicken so it’s a great buy. Save your money and eat at home while chillin’ at the same time. What’s your tip for beating the heat? A nice pasta salad doesn’t require a whole lot of heat, only to cook the noodles, and is a great summertime meal that is very refreshing in the heat! I always eat at home and typically use my George Foreman to do so. It is much cheaper and most always healthier. Great tips. I love to save money anyway I can! Good list. We also like to keep cooked meals in the freezer that are leftovers from meals I’ve cooked. We can buzz them up in the microwave for a quick meal. I used my crock pot but something felt “wrong”. However, I just realized that it was not so hot when I was using the crock pot. Whole chickens are on sale this week so I know how I am going to cooking my chickens. We just tried something new – frying bacon on the grill. Tomatoes are ripe in the garden, but I didn’t want to heat up the kitchen frying bacon for BLTs. Plus I hate the greasy mess and smell it leaves in the house. So I saved and washed some of those short aluminum pans from bakery goods and used those to fry the bacon on the grill (we have a gas outdoor grill). No muss, no fuss and no greasy mess to clean up – I threw away the pans when I was done! The bacon turned out great and even had a nice, slightly smokey flavor. Sometimes we get the already cooked meat (esp chicken) from the grocery. They keep it under a hot lamp and it is still warm when we get home and munch it down. It’s cheaper than fast food. We like to do tuna salad on whole tomatoes with iced tea when it is really hot. Compared to the power consumption of the oven and the heat it generates inside when on, we prefer to keep all the heat outside with the grill and roaster. Previous post: Is Your Hobby Holding You Back Financially?